I've been waiting for the spring tides. The early morning session described in my previous web page was partly in the way of a recce to see whether there was any weed and maggots about for the next few days. After catching five fish on the first morning I couldn't resist another go and the following day I had four more schoolies. My walk along the shore showed that there was weed and maggots almost everywhere - could this be a potential bonanza for the coming set of springs? Of course it was too much to hope for. When Nigel, Rob and myself arrived at the shore, a couple of days later, there was a stiff SW breeze and quite a big chop on the water. Perhaps it would wash lots of maggots into the sea we told ourselves but we were a little apprehensive. Sure enough there were maggots galore and quite a few black headed gulls feeding on them but not a sign of a fish. Still, the tide had an hour-and-a-half to go so there was time for the fish to turn up. We began to spin with weedless lures (the edge of the sea was full of drifting weed) and were soon encouraged when Nigel called that he was into a fish. The bass turned out to be a small one but it was a start. Not long afterwards I saw that Nigel's rod was bent again and this time the bass proved to be about four pounds - nice catch. 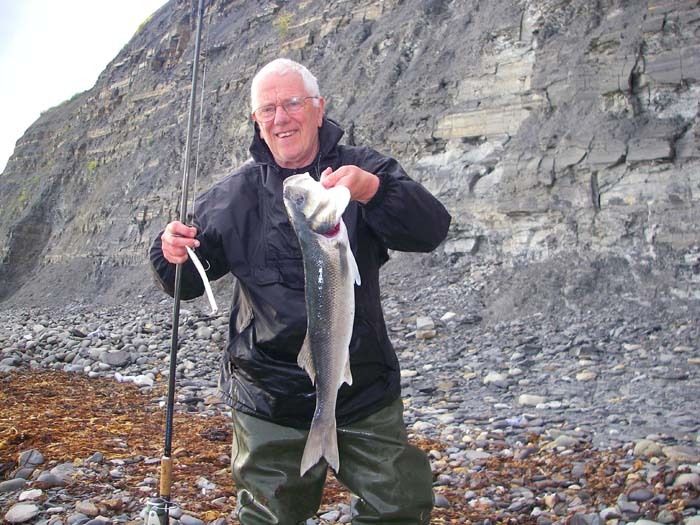 I'd noticed that he was casting further that we were and an enquiry revealed that the fish had both taken at distance. His 'Slandra' was one with a short tail and so it had less air resistance and was going perhaps five or ten metres further than my long tailed lure, even though I'd added a bit of lead strip to the hook shank. After a while I eventually had a bite and hooked a small bass which - came unstuck as I was about to land it. I changed lures to a heavier bodied weedless soft plastic and began to fish again. 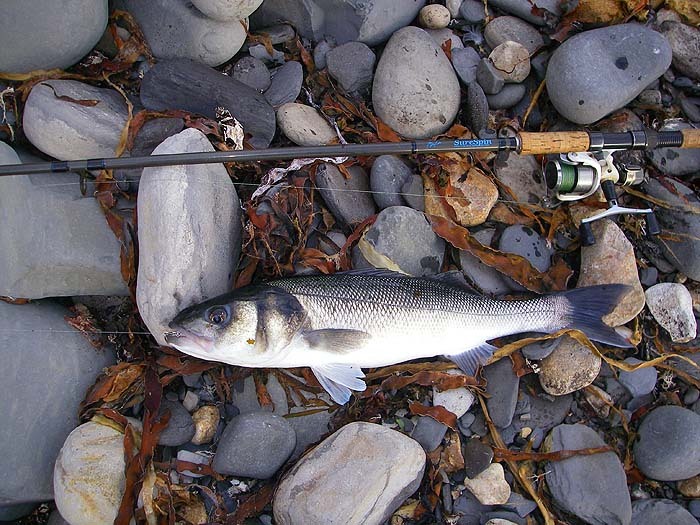 Meanwhile Nigel had his third bass - again a small one. My change of lure worked and after three or four casts I also had a schoolie. Poor old Rob meanwhile hadn't had a sniff. It just hasn't been his week I'm afraid. He'd broken a finger in his right hand playing football then he'd cut a different finger on the same hand so not only was it tricky to cast with his fingers bound up with plaster but he was obviously in some pain (it didn't stop him fishing though!). By now it was the turn of the tide and almost time to go. As we were thinking about packing in a few mullet appeared, so we hung on. Soon there were lots of fish skimming the surface but they were too far out and the wind was too strong for fly fishing. I decided to have a final fling with the weighted Redgill that I'd been using recently. The heavy weed seemed to be restricted to the margins so, although the lure is not weedless, it was OK. It was an inspired change. The plastic eel cast a fair bit further than my previous choice and after about five minutes it was taken as it hit the water. Eureka! A decent fish of five or six pounds was taking line and thrashing at the surface. I landed it. took a couple of pictures and put it back. It was a bit on the thin side compared to its smaller bretheren that we'd been catching but welcome nonetheless. We fished on for a little while but caught nothing else. All in all a good trip.